Active Splitters usually have microphone or line-level input(s), followed by an amplifier which then drives numbers of transformer-isolated outputs. 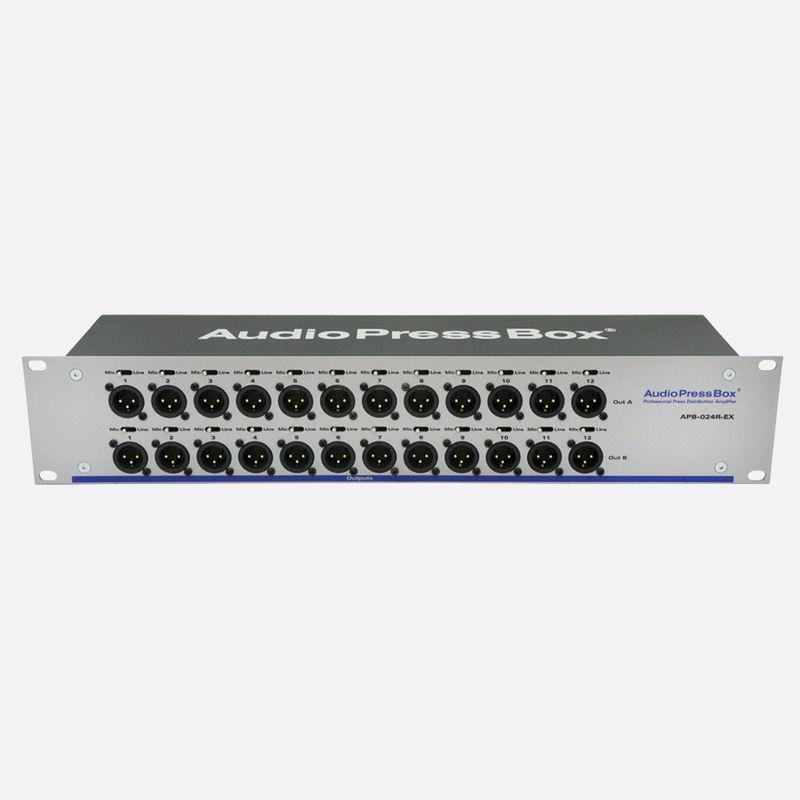 They can generally provide many more outputs than passive types and, having onboard electronics, often include adjustable gain, metering, microphone/line output level selection, high-pass filters to reduce low-end rumble and compressors and limiters to control levels and prevent overloads. Since they rely on power to work at all, onboard batteries or redundant power supplies are positive benefits. 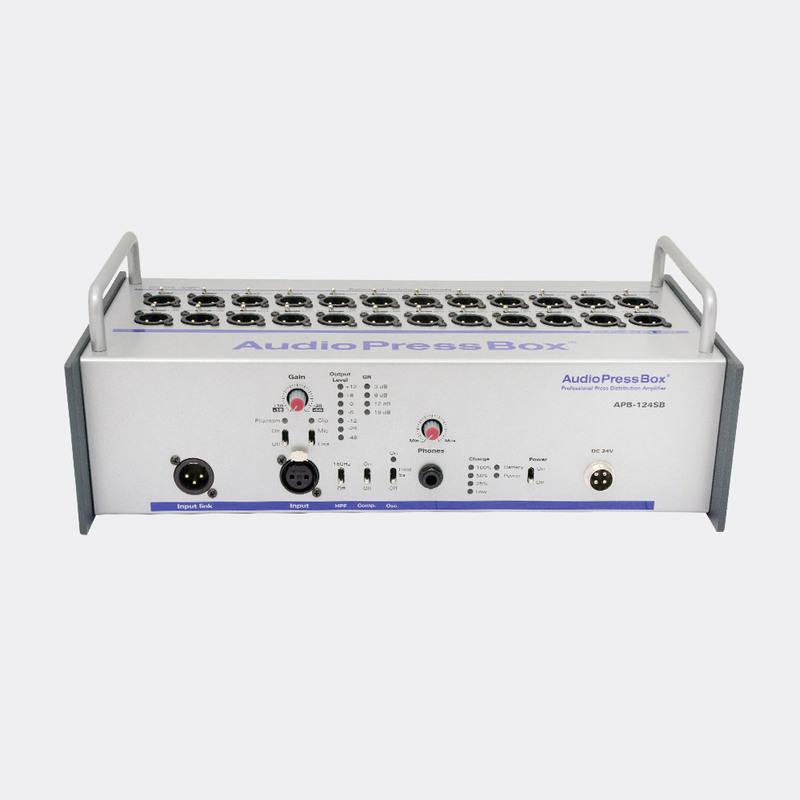 Active splitters have individual outputs and sometimes outputs to feed 'expanders'. The APB-116P has two sloping panels to the front and rear. The two ends are timber, with slots to provide carrying handles. 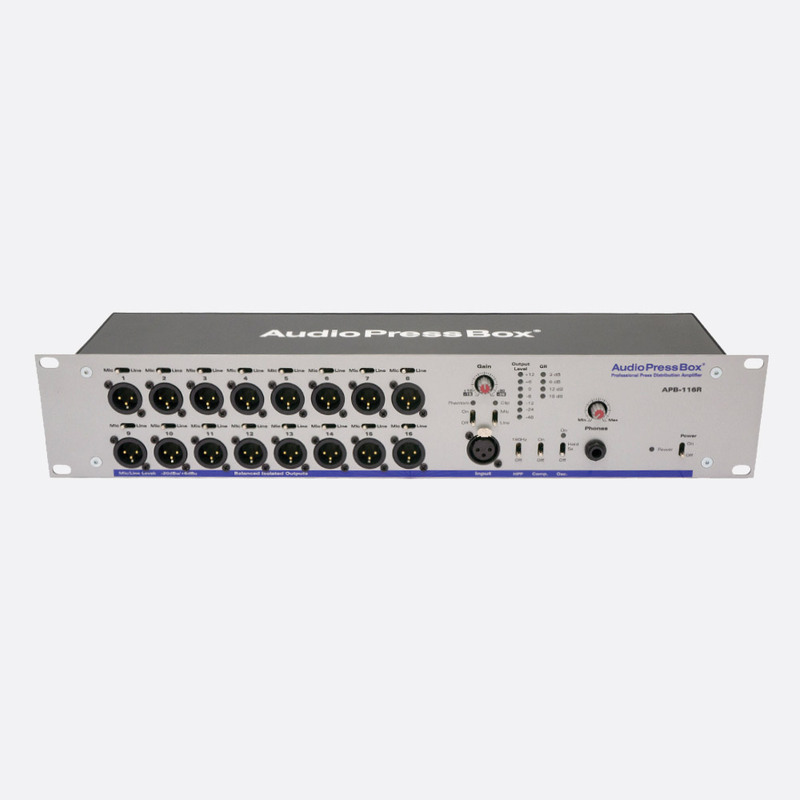 On the rear there are sixteen XLR outputs with adjacent microphone-line level switches. Controls, input and power input are on the front. 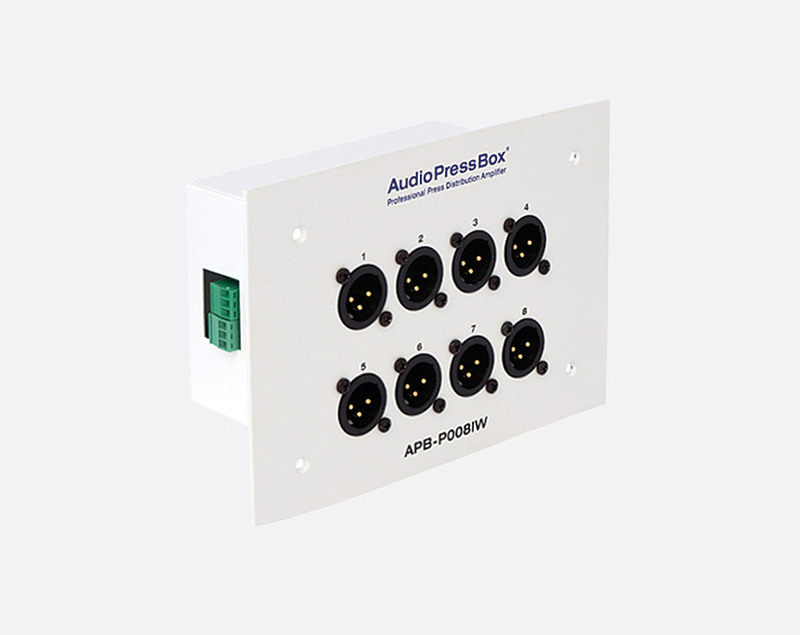 Built in steel boxes, designed to be placed on the floor, these have connections for the inputs and controls, metering, indicators and power supply inputs on the side. On the upper surface there are a number of XLR outputs with adjacent microphone-line level switches where applicable. These are 2U high, rack mounting cases. Inputs, controls and individual XLR outputs are on the front. The rear has the power supply connection, expander outputs and, depending on model, a second power inlet and/or parallel connections to the input connectors on the front panel. These are built into heavy-duty, waterproof, moulded resin cases, intended for both indoor and outdoor applications. They have internal rechargeable batteries which can power the splitters for ten hours at full load, or can be used as standby power when using the external power-supply and charger. All controls and connectors are fitted to a flat control panel screwed into the case. There is space at the rear for storing the (supplied) power supply. 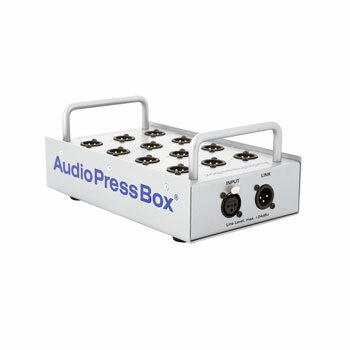 This includes an APB-D100 drive unit with a single line input and four APB-008 SB-EX portable expanders to provide 32 mic/line outputs. These are supplied in a fitted, heavy-duty, waterproof, moulded resin case. 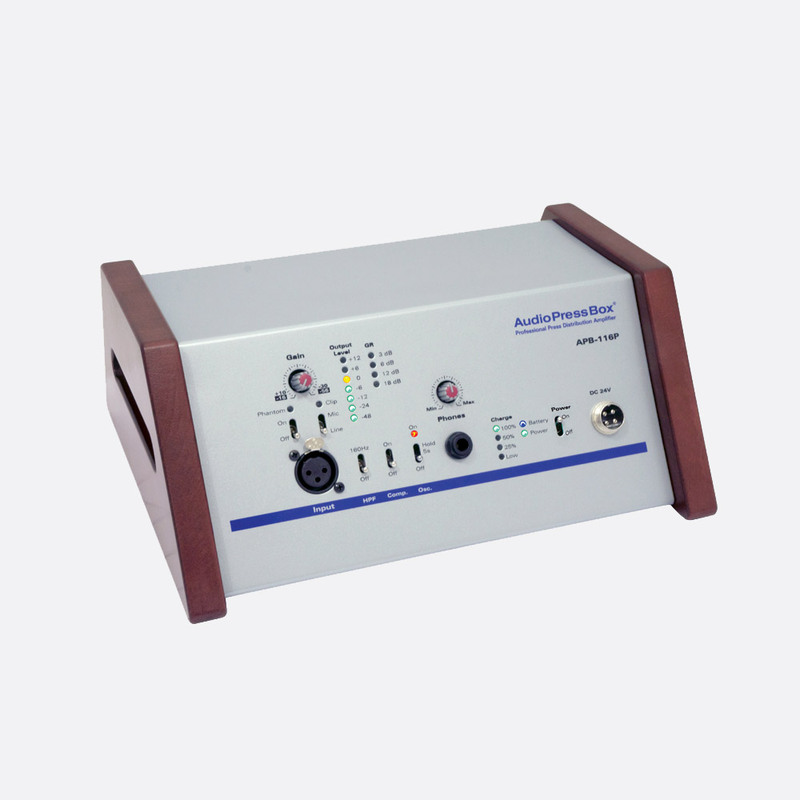 Each output is independent, transformer-balanced and isolated. 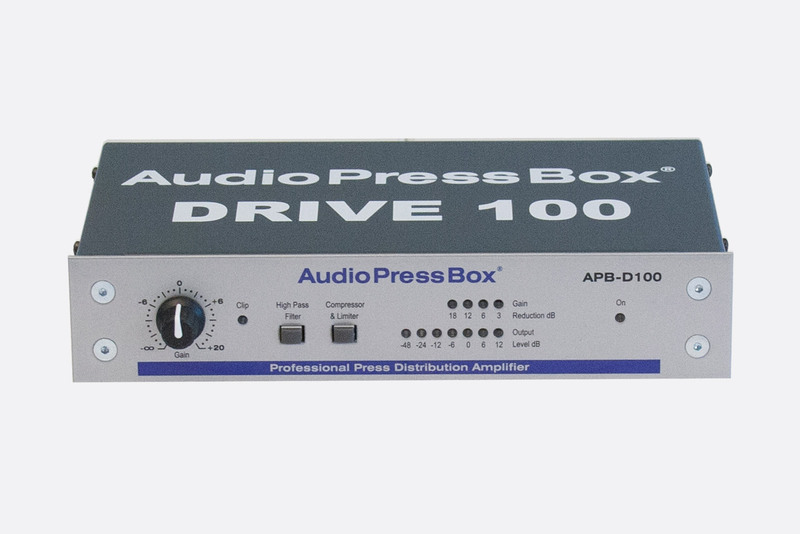 The drive unit has 2 buffered expander outputs and can power up to 48 mic/line outputs. 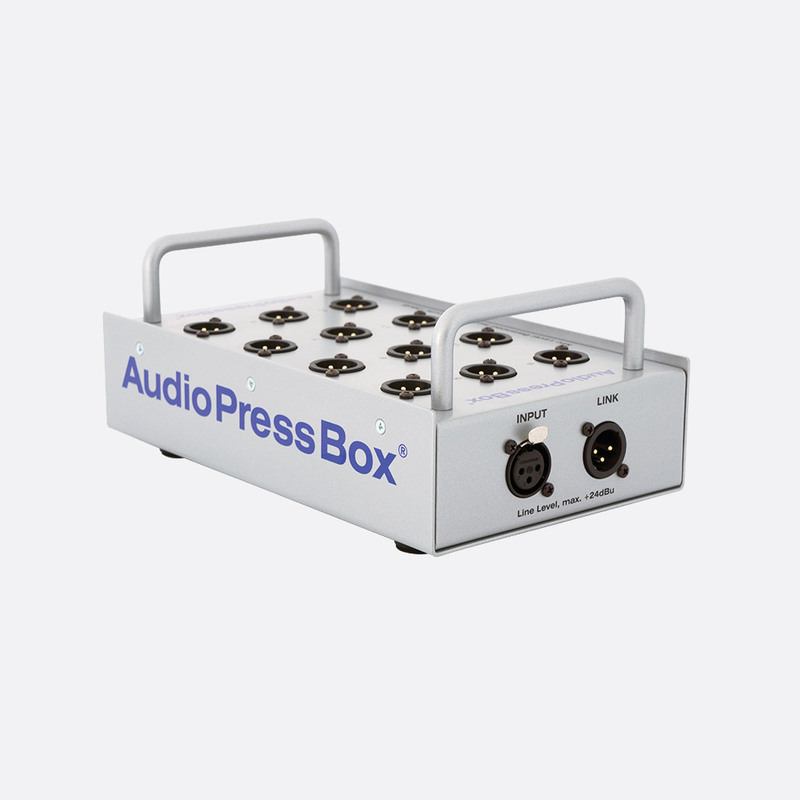 Any Audiopressbox expanders can be connected to the drive unit, not just the ones in the kit. An advantage of this combination of units is that the portable expanders can be connected in a chain in two directions. The total length of the cable in each direction can be as far as 500m, so any conference room of any type or shape can be covered. 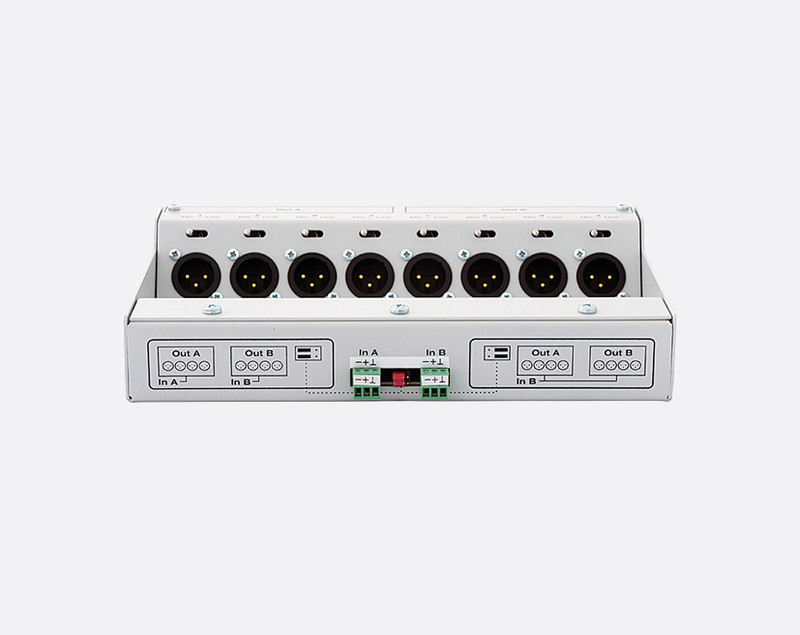 The RC 3.5 - 8 is an eight-way cable which provides eight channels of the same functionality and is 3 metres long. It consists of an eight pair multi-pair cable, broken out into eight tails at each end. Lieferung von diesem Produkt ist nur innerhalb des Vereinigten Königreichs (Festland) möglich.